Born and raised in Paris, Romane is currently pursuing her master of social sciences at the Ecole Normale Supérieure in Lyon. During her interdisciplinary (art,'hard sciences,'and social sciences) bachelor, she studied how very different disciplines could complement each other to deepen our understanding of major issues. She spent a year at the University of California, Irvine. There she became interested in making documentaries and participated in a renovation project at the Manzanar Japanese Internment camp. Rich of this experience, she has worked as an intercultural youth work camp leader where she fostered dialogue through "No hate speech" activities. 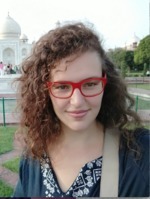 In the past year, she has studied political sciences and sociology of education in India and Norway. As a part of her engagement for the better integration of refugees, she has biked across France with 10 students and 10 asylum seekers to visit villages that have favorably welcomed refugees and citizen initiatives.